This re-imagining of twee middle class suburbia, as seen through the fractured lens of a distinctively Brookesian eyeglass, is a visual triumph. A certain bleak humour would be one; quiet reflections on the futility of the human condition another; and it wouldn’t be a Brookes offering without the dark undercurrent that courses through all the artist’s work. But of all the recurring aspects of his oeuvre it is, ironically, its unpredictability that is its most familiar element. 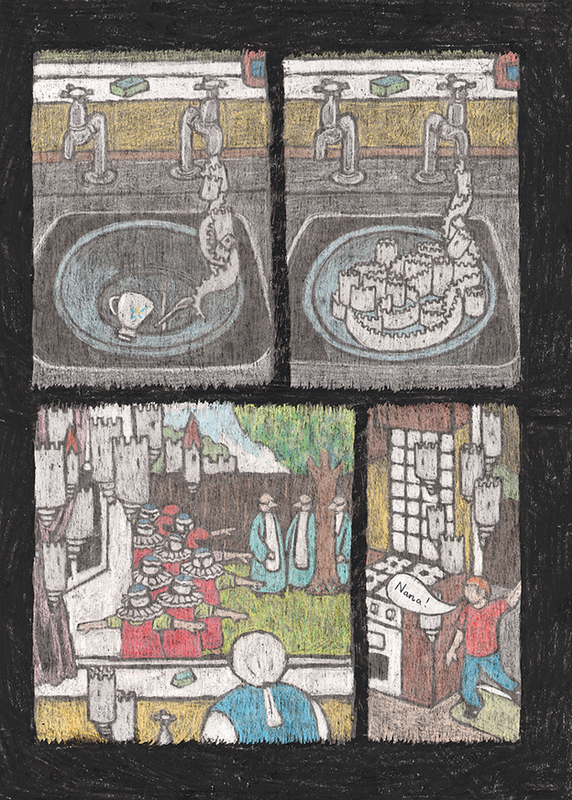 Brookes has a constant urge to play with medium, structure, presentation and form which means that, although all his comics are recognisably Brookesian in scope and theme, each one is a distinctive and discrete entity unto itself. 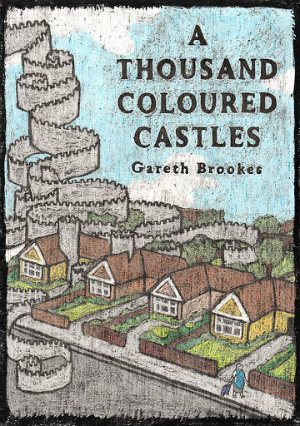 After his much lauded Myriad First Graphic Novel Competition-winning The Black Project his second graphic novel A Thousand Coloured Castles underlines Brookes’s consistent stylistic experimentation. 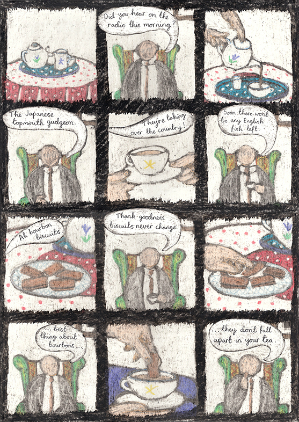 The book sits somewhere between graphic medicine and middle class suburban thriller and centres on the lives of Myriam and Fred, an elderly couple living in quiet domesticity until strange goings-on in the house next door begin to impinge upon their everyday lives. Fred is a tiresome bore who spews out Daily Mail soundbites as if they were the profoundest philosophy while (presumably) long-suffering Myriam – who seems to let his overbearing pomposity wash over her – has far more concerning worries to occupy her mind. Her eyesight is failing and she has developed Charles Bonnet Syndrome, a condition where the mind fills in the visual blanks resulting in the the sufferer experiencing bizarre hallucinations. This makes the enigmatic happenings next door all the more confusing for Myriam as she becomes convinced of the existence of a strange and heretofore unknown presence in the neighbouring domicile. As her perceptions of the world around her become ever more fantastic and unlikely how much of what she thinks she is seeing is rooted in reality and how much of it is in her mind? 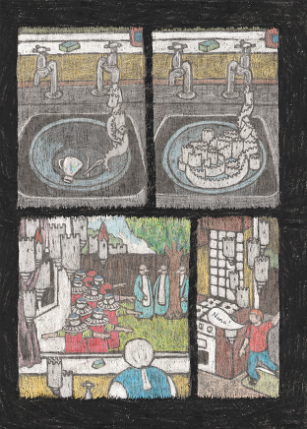 A Thousand Coloured Castles is a book which we interact with on a number of different interpretive layers as conflicting realities are interwoven. On the most obvious level we are experiencing and being immersed in Charles Bonnet Syndrome by proxy as Myriam’s daily routine becomes filled with organic pylons, ladder-hatted soldiers, boats sailing down the street and silent synchronised troupes of helmet-wearing little girls. Simultaneously, though, we are also dismissing those hallucinatory digressions and living the more pedestrian life of Fred where curry for tea is an outlandish foreign abomination, poor-performing glue is almost certainly the result of EU interference and half past ten is regulation time for a toiletary visit. Brookes invites the readership to dissect the events of each mindbending page and to sift through the clues as to what is real and what is imagined, while at the same time he impishly muddies the narrative waters. There are no boundaries to perception here in a world where subjectivity rules and the objective is redundant. Myriam’s isolation and her determination to soldier on regardless as her entire personal universe dissolves into insensible chaos is almost chilling in its steadfast stoicism. In this regard the facelessness of the characters in A Thousand Coloured Castles doesn’t so much dehumanise them as emphasise Myriam’s detachment from those around her. And yet there’s also a discernible irony to her relationship with the obtuse Fred who, in his own odd way, has created a reality for himself that is even more divorced from actuality than hers. 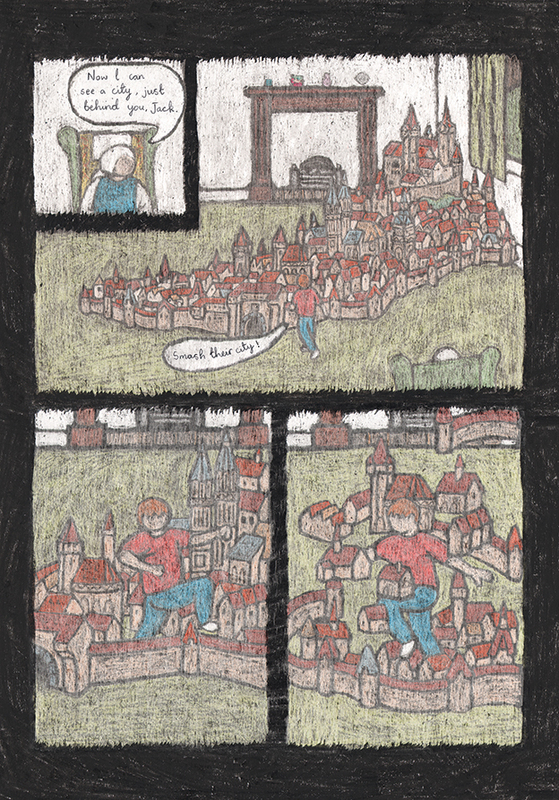 The central plot (rather than the premise) of A Thousand Coloured Castles is essentially a slight one but this a book where the journey is infinitely more important than the destination. A rather different crayoning technique (below) that some may remember from their childhoods is utilised by Brookes to give a sombre yet dreamlike air to Myriam’s ordeal and, as the story progresses, the illusory nature of her understanding of her environment gets ever more involved and frenetic. 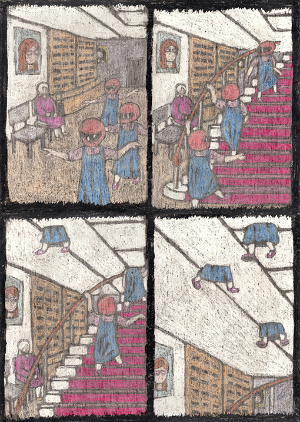 Brookes’s rendition of this entrancing phantasmagoria becomes almost hypnotic in delivery as we approach the book’s denouement, taking on a stunning kaleidoscopic visual intensity. While The Black Project was Brookes’s crossover book with its dark wit and familiar examination of gauche boyhood providing an accessible entry point and an appeal to non-traditional comics readers, A Thousand Coloured Castles speaks the language of comics with a dialect that the uninitiated may perhaps find a little harder to comprehend. But, make no mistake, this re-imagining of twee middle class suburbia, as seen through the fractured lens of a distinctively Brookesian eyeglass, is a visual triumph. 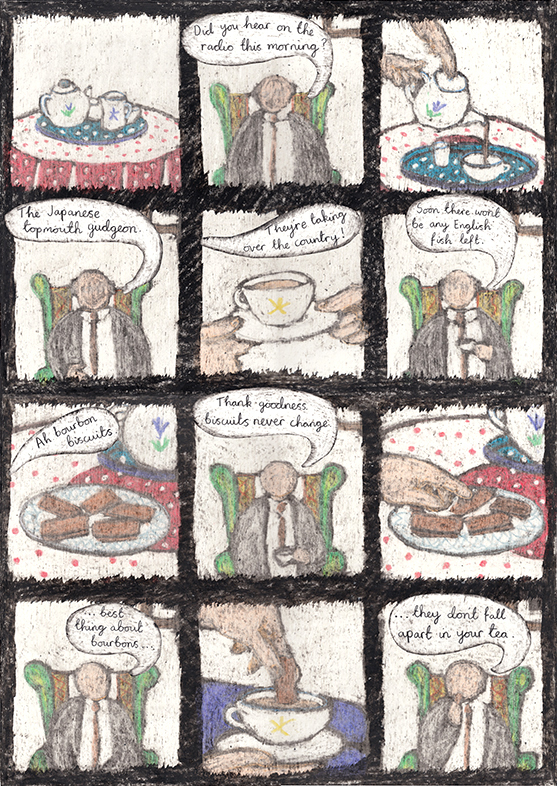 In terms of challenging the boundaries of the form, constantly pushing it into new arenas and exploiting its every storytelling possibility, Gareth Brookes (alongside Karrie Fransman) is undoubtedly one of the two most important creators currently working in UK indie comics. 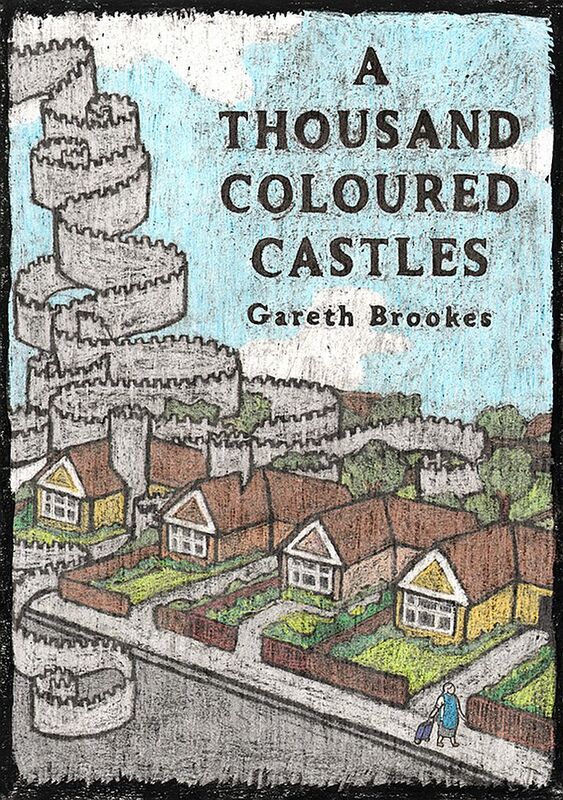 You can buy A Thousand Coloured Castles online here. Staff Picks for July 20, 2016 – For the Love of God, Marie!, Black Hammer, Ready for Pop, The Hunt, Plutona, Snotgirl and More!